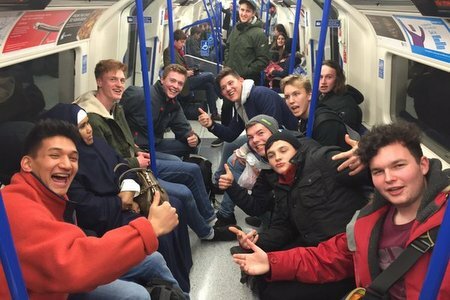 The Senior Trip to London: apparently it’s all in the name…..
After a very early start for the lads in the Senior section of USG (10.45am to be exact), 17 lads and 7 leaders jumped on a train, ready for the appropriately named Senior Trip to London. We arrived into Waterloo as the rain stopped and the clouds cleared, and promptly headed to the South bank for Lunch. A local hot food market was on hand for those who needed it, however the inflated London prices came as a surprise to some of the less regular London visitors! The end of lunch marked the start of the, again appropriately named, Senior London Game. The lads were split into teams, each with a leader, and were given different challenges around London to complete. One of the more difficult tasks proved to be finding an USG leader in a bustling Covent Garden, with one team searching for over 45 minutes without success! Other challenges included buying the cheapest item in Harrods, singing a song under the Thames whilst not on a train (Greenwich Foot Tunnel for those interested) and engaging the public in a speech at Speakers Corner. 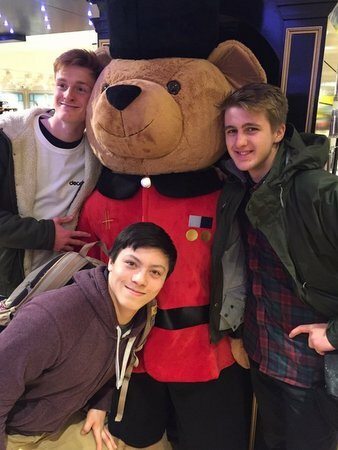 After an afternoon in teams, the group reunited at Leicester Square before heading to China Town for a well deserved Chinese meal. This was a great opportunity to chat about the day, and create closer friendships within the Senior section. A final dash for the 9pm train home rounded off a fantastic day out for the Senior section.